The news was revealed on Sylvester Stallone's Instagram where he declared that he has completed the Creed 2 script. At least a first draft anyway. That is exciting news on its own, but it was his very particular use of hashtags to go along with his post, which shows a photo of handwritten script pages, that will get Rocky fans buzzing. Here's what Sylvester Stallone had to say in his post. "Just done....if you are curious , around 439 handwritten pages translates into about a 120 page typed screenplay ...#writers cramp #rockybalboa #drago #adoniscreed #MGM"
So there you have it. That simple #drago is enough to pretty much confirm that, in some way shape or form, Ivan Drago is going to be featured in Creed 2, along with Michael B. Jordan returning as Adonis Creed, son of Apollo Creed. Now, in what capacity is very much up in the air. 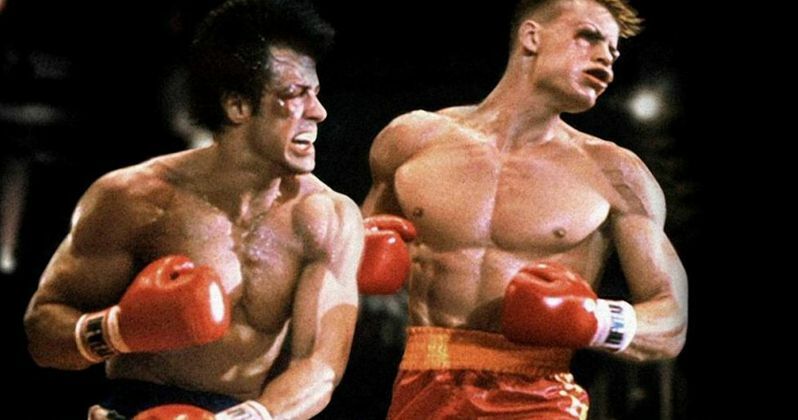 Stallone recently posted a photo to his Instagram that features Michael B. Jordan's Adonis Creed getting ready to square off with Dolph Lundgren's Drago in the ring, which was photoshopped from Rocky IV. This led to a lot of reasonable speculation that Drago could be returning to the franchise. With this, unless Sylvester Stallone is messing with us in a purely nonsensical way, we can safely say it's happening. The other important thing here is that the Creed 2 script is finally done. Creed came out in 2015 and was a big commercial success, grossing $173.5 million worldwide. The movie was also a massive critical success. Sylvester Stallone even managed to earn a Best Supporting Actor nomination at the Academy Awards for portraying Rocky Balboa. He ultimately lost to Mark Rylance, which many felt was a robbery. It still isn't clear if director Ryan Coogler is going to return. He's been busy with Marvel's Black Panther. But maybe after that comes out in February he will be free. Or maybe Stallone could step in and direct? He was behind the camera for Rocky IV, so it would feel appropriate. Rocky IV is considered to be one of the true high marks of the franchise and arguably the best sequel in the series. Though, Rocky II might have something to say about that. So bringing in shades of that with Ivan Drago for the Creed sequel could be a major draw for long time fans. Hopefully, with the Creed 2 script completed the sequel can finally get going and make its way into theaters sooner rather than later. You can check out Sylvester Stallone's Instagram post for yourself below.